First of all, I want to thank you for running such an excellent facility. In each of the last 3 visits I’ve made to Los Angeles, I’ve worked in a visit to the Getty, and hope to visit in the future as scheduling permits. I understand that Mr. Getty’s vision of his museum was that the public have an opportunity to engage with great art. 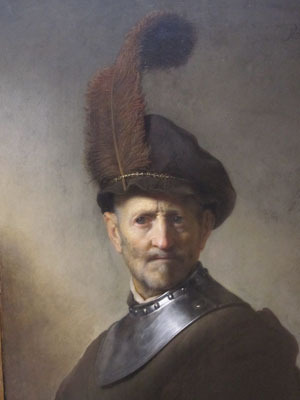 On our last trip, while wandering through the exhibits, I came across Rembrandt’s “An Old Man in Military Costume” What struck me about this piece is the resemblance between the subject of the painting and my neighbor Bill. I asked the security guard if I could take a picture of it, and he politely explained I could do so as long as the flash was disabled. The resemblance isn’t perfect, but we were both very happy with the result, and felt compelled to share it with you folks. Once again, I’d like to thank you for all the good you do, and for adhering to Mr. Getty’s concept of making great art accessible to everyone. 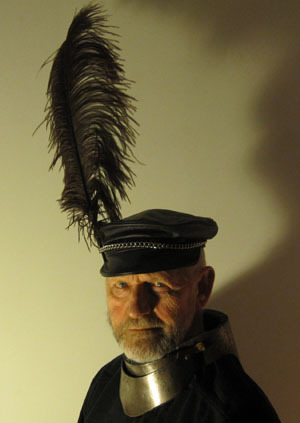 This entry was posted on Friday, February 21st, 2014 at 6:58 pm and is filed under Uncategorized. You can follow any responses to this entry through the RSS 2.0 feed. You can leave a response, or trackback from your own site.